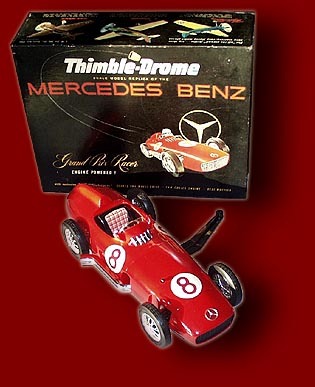 A more complete listing of Thimble Drome and Cox models can be found on my Model Database page. 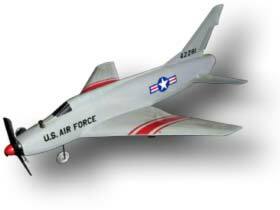 This was LeRoy Cox' first entry into the world of model aircraft. The model was using a unique wing structure composed of shiny upper and lower aluminum shells. 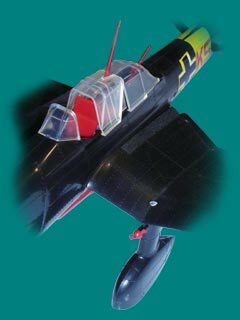 The fuselage was injection molded plastic and came in yellow, red or blue (later also in white, then called "Skymaster"). It used a modified Space Bug engine mounted in a sleek cowling. At $9.95 it was quite expensive then. I have redrawn the fuselage decals - e-mail me if you want a copy of the file for printing on clear self adhesive film (e.g. in PDF or CDR format). 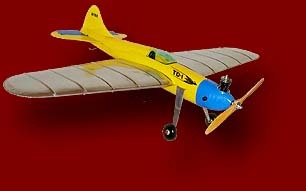 This was the second ready to fly model in the TD series. 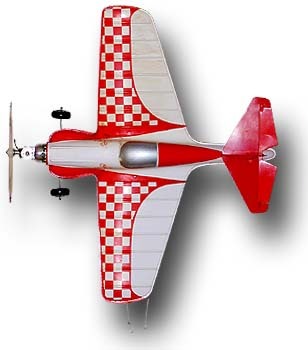 This particular model has the white body and red checkerboard paint scheme «Flying Circus». Similar to the TD-1, its main structure consists of two horizontally split shells, which are joined by a visible bead. The engine is an early Babe Bee, which followed the initial Space Bug Jr. used on this model type. My model came with a big hole at the end of the fuselage, several cracks and a layer of yellow castor oil staining the complete surface. Unfortunately the white material has absorbed the oil so that it could only be cleaned by mechanical work (scraping and wet sanding). I decided to clean the left half of the model only and to keep the right half in "working condition". This was the first tether car model made by Leroy Cox. During these early years, as he did not have much experience with the manufacturing of small engines, he bought the cylinder, piston, conrod and cylinder head from Mel Anderson. The same parts were used in the Anderson Spitfire .045 (“Spitzy”) engines. The power unit itself is extremely compact and of a clever design by LeRoy Cox and his engineers. It consists of the engine, planetary gearbox, fuel tank with filter and exhaust system. The twin reed valve inlet was breathing through the hollow rear left half axle and the exhaust was used to lubricate the gearbox. For me this model looks very sleek and more elegant than its larger and more powerful brethren. The car was also available as a cheaper pusher model without the engine and also with a spring clockwork engine. 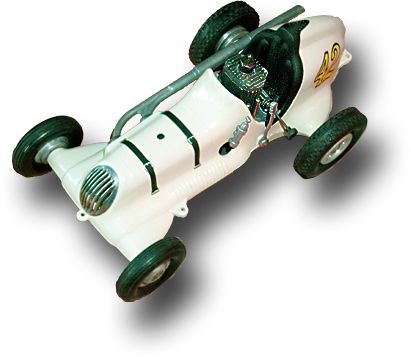 As the small “Special” lacked power in comparison to other tether cars, Cox developed the “Champion” family. 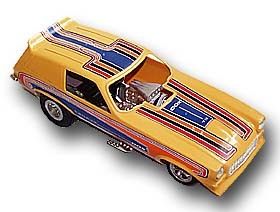 These models were advertised in form of a pusher and also in three powered versions. The smallest one equipped with a .098 c.i. engine was named “Doodle Bug” (1949). The medium sized “Champion 15” was powered by a .147 c.i. engine (1948) and the most powerful variant, the “Lightning Bug” came with a displacement of .199 c.i. (1949). This version was advertised as reaching speeds of up to 75 miles per hour. The glow engines for these cars were again produced by the Cameron brothers in Chino California. All these Cox cars had cast aluminum bodies and were painted in various colors. Additional parts like handbrake or the dummy radiator grille on the Champion were of cast aluminum too. 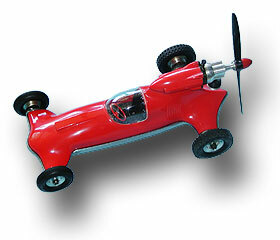 The hot Prop Rod was a unique design, which was adapted over the years to lead via an all-plastic Prop Rod finally to the R/C Shrike. The very first Prop Rod models came with the Space Bug Jr. The sample shown here was the first version of the Prop Rod with the new Babe Bee engine. It still has the cast aluminum bottom pan. Similar to the Thimble Drome Special, the wheel rims were turned from aluminum. The Prop Rod featured a detailed cockpit with gauges and a steering wheel. It could be run free or tethered around a center post. The Super Sabre was one of the few models equipped with the small .020 PeeWee engine. The flight performance of these small Models (like the Pitts Special and the Ryan PT and Ryan ST) was obviously quite limited by their low weight and the high drag of the control lines. The low weight made these models prone to turning into the circle when they encountered even a mild breeze and the control lines were not shortened accordingly. In case of the Super Sabre additional difficulties with a forward position of the center of gravity required considerable "up" elevator trim, causing additional drag. The Water Wizard, was the first boat produced by Cox. Like the Prop Rod, it was powered by a Babe Bee engine. 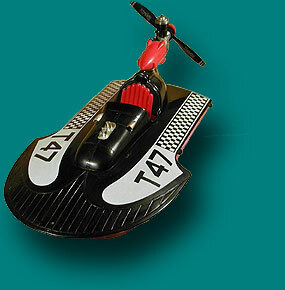 On a smooth water surface it could reach high speeds. A Dubl-Tuf prop has bee donated by Milton Dickey. 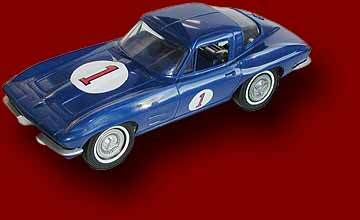 The Corvette, which was available in blue, red, black, and white, was powered by a Babe-Bee product engine. It was mounted on a steel chassis, which was also used for other models (Buick Riviera, Ford G.T., Chaparral and the Group Seven car). All these models were approximately scaled by 1/20 and could be raced free, tethered around a pole or drag raced along a straight string. Additionally, a slotted race track was available, eventually leading to the electric slot racing hobby of the 1970s. All these models were quite detailed, with chromed plastic parts which had to be assembled by the buyer. The timing of the engine was tuned for higher performance by raising the cylinder by a washer between cylinder and crankcase. 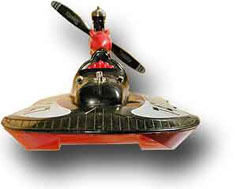 The Sea Bee, was powered by an inboard Babe Bee engine. This engine was air cooled and it was coupled to drive shaft with a flexible coupler. A pull starter with an automatic clutch was used. The rudder could be adjusted for free running, but it also had two eyelets for running around a center post. The boat was also available in a green/cream color scheme. 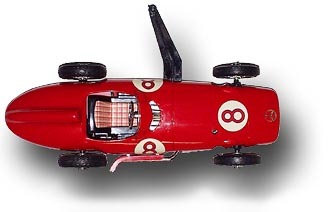 This is a great looking model of the German 1954/55 racing car. In my eyes, one of the most desirable Cox cars. The Mercedes-Benz Grand Prix Racer was quite complex with a front mounted .049 engine, connected to the rear axle gearbox via a driveshaft with universal joints. Both axles were spring suspended and hard vinyl wheels with nicely detailed spoke wheels were fitted. The model was run on a 4.5 m (15 ft) tether cable attached to the black bridle and a center post. 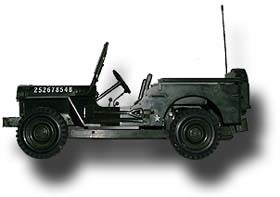 This US-Army Willy's Jeep is a model with a lot of details like shovel, gearshift, antenna, and has an adjustable steering, which could be reworked for R/C control. The engine and drive system represents the typical spiral gear system with the sliding gear (mechanical clutch) of this model generation. 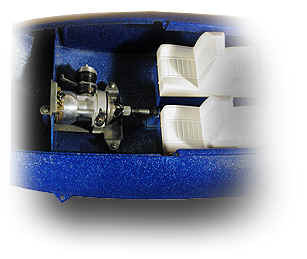 A pull starter is used to start the .049 (0.8 cm³) Bee type engine and the fuel tank is located in the front of the car. This funny car has no steering - it ran along a straight course, until the engine was stopped. The engine is always engaged with the rear axle - there is no clutch mechanism. The model traveled along a string and the engine was killed, when the end of the thread was reached. Additionally, a parachute was deployed. I have not tried it out, as it was a lot of work to clean the model from the old fuel and oil residue (yuck!). But I have heard from former owners, that it was very difficult to get the model to run as it should (at least for kids). In the 1960s and 1970s, Cox sponsored several racing teams like Bill Schifsky and Danny Ongais running funny cars and AA dragsters. During the period from 1965 to 1967, COX also sponsored the Chaparral race cars (drivers: Hap Sharp and Jim Hall). Sponsorship also included air races, e.g. "Miss America", a P-51D Mustang piloted by Howie Keefe. My model is still missing the «safety cage» for the driver as well as the parachute and the windscreen. The front bumpers and the fuel cell have been added by now, though. 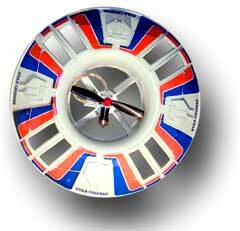 The car has the classical .049 (0.8 cm³) Bee type engine with a flywheel and a cooling fan. 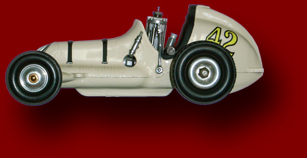 There exists another model of an open wheeled dragster (Eliminator II) with a similar chassis, and a small downforce wing near the front wheels. Another similar car in pearl white (the Pinto) has also been manufactured during the same period. This car came with a 1 channel radio, which was used to steer the car and to control the throttle at the same time. Overriding the stops at the end of the steering wheel range caused the engine to «shift» either up or down in throttle. Starting the .049 (0.8 cm³) Bee type engine was accomplished by rapidly turning a flywheel attached to the engine. 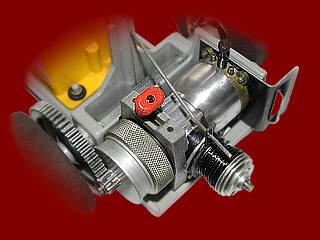 This wheel was connected to the spiral gear system with the sliding gear (mechanical clutch) of the previous models. The car was also called Magblaster (w/o R/C) and there was also a «Vanblaster» available, using the same chassis, but opening forward via front hinges instead of sideways. 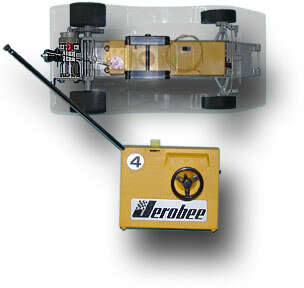 The JoMac company manufactured this 1/12 scale Jerobee two channel R/C car. Cox produced the power units for these models consisting of engine, tank, starter and flywheel units. Between the engine backplate and the car chassis we can see a thin black sheet aluminum heat sink which also directed some air flow towards the cylinder - probably not very effective. JoMac sold the cars in various forms. 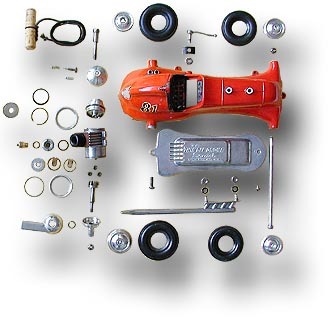 The R/C transmitter with its angled screw-in antenna featured a steering wheel and a throttle lever which actuated the exhaust throttle using a piano wire linkage. The Junkers «Stuka» was a very popular Cox model which started it's career in green color in 1962. The black variants were produced since 1966, finally with upright engine installation up to 1985. The «Stuka» is a large and heavy model with a small lever arm and it's flight characteristics were not up to its good looks and it required a skilled pilot. However, with its many fine details like sliding canopy parts, pilot and gunner, machine gun, antenna, sirens and a droppable bomb it makes a great display model. 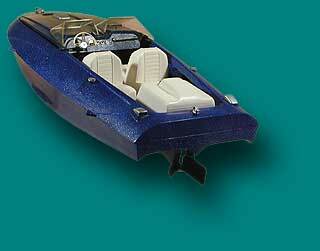 A model from the «Buck Rogers» series of Cox models developed during the Leisure Dynamics ownership of Cox. 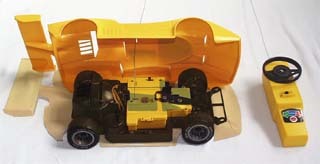 It was made very simple from one single piece plus the engine and a set of stickers. Rotation was prevented by four angled blades inside the propeller slipstream. 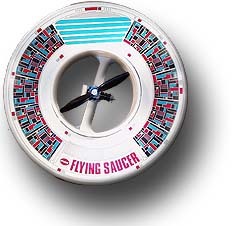 This «free flying engine powered space probe» looks weird and seems not to have been a big commercial success. Maybe it would have been in the 1960s. Also, it was probably not very long lived with its cardboard top cover and a few stickers attached to the bare styro-foam surface. An early prototype of this model is said to have crashed near a small town, named Roswell, after its glow head burned out - but this accident has never been acknowledged in the public by the company. This control line model has been re-issued several times under different names and color schemes. The "Hustler" from the "Wings" series as shown came with a slotted exhaust screen cylinder which reduced power and minimized the risk of finger burns. A typical control line model has two wires. A typical electric motor needs two wires. Hmmm... - why not combine both into an electric control line model? The pilot holds the handle with an on/off switch and attaches a 9.6V racing pack of NiCd cells to his waist. The whole thing is very clean and nearly silent, but I am not sure, whether it is as much fun as its fuel spitting, howling cousins. This is a typical control line model with the .049 Babe Bee engine. It looks great, with its dark blue US-Marines paint scheme. In the side view, the wing angle of incidence seems to be very high. 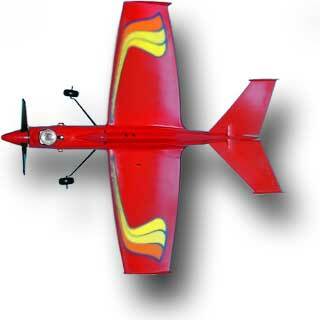 This control line model was styled after the typical AT-6 class Reno air racer. It looks very nice, with all the stickers attached. As the company had been sponsoring a full size AT-6, the model also has two small sponsor stickers. 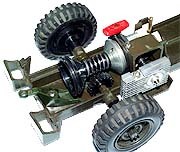 A later, 1998 version of this model has an additional function to drop "bombs" on a target. With its light gray NAVY paint scheme, this control line model looks very elegant, despite its fat belly. It is heavily riveted and features a «flick of your wrist» throttle mechanism: a quick flick of full up elevator opens the exhaust throttle and a short flip of down engages the throttle. Surely something you have to practice before trying this close to the ground. 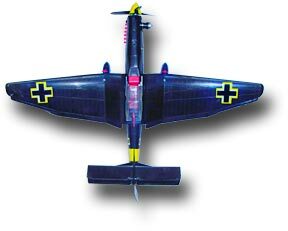 On this model, the three bladed prop is turning counter clockwise; the lower half of the fuselage and the wing are molded in one piece. I assume, that the same moulds have also been used in the mid-1960s for the first series of the Skyraider. 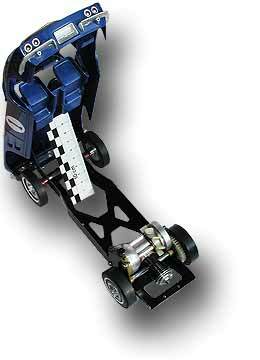 This was the last stunt control line model developed by Cox. 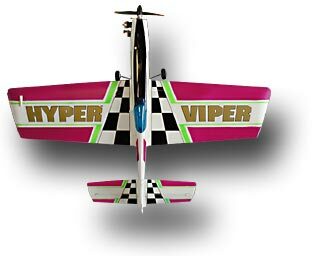 It has been developed for good flying characteristics and great aerobatic performance. 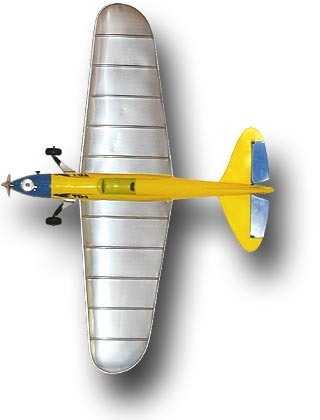 Similar to a few former Cox stunt models (Crusader, Me 109) its lightweight foam wing has a symmetrical airfoil section which together with the short tail lever makes it highly maneuverable. It is a good aerobatic trainer, after mastering a trainer like the PT-19.